How much am I supposed to spend on a gift for my daycare provider? Proper etiquette experts say that for the holidays, a daycare provider's gift should equal one week's pay. Although, as a provider myself I'd love a gift like this, it's pretty unreasonable for the average family to be able to afford. Decide what is reasonable for your budget. Just be sure to realize that your daycare provider is an important part of your family dynamic and she deserves the best. Put her at the top of your list no matter what you can spend. Gifts come in all shapes, sizes and monetary value. The monetary value isn't the most important part of a gift. It's the thought that goes into the gift that counts the most. 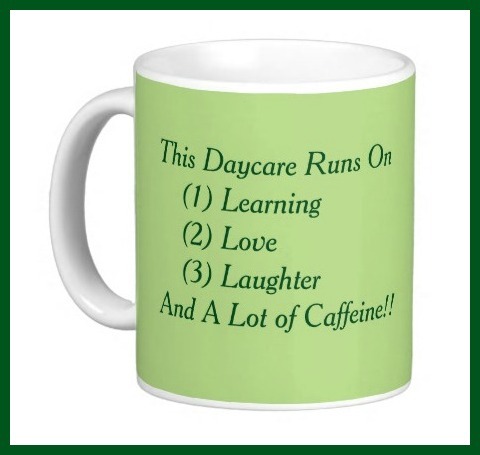 Very popular items to give a daycare provider are candles, coffee mugs and bath sets. Although these are nice gifts to receive, keep in mind that it's very common and your provider probably already has more than she needs. 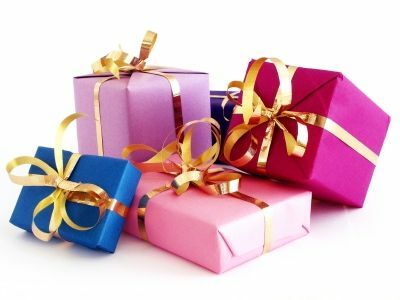 I've taken some time to gather a list of unique gift ideas for your favorite provider. Some of these ideas have links to my website affiliates. These are stores that I earn a commission from and help me keep DaycareAnswers online. Purchasing from an affilliate of mine does not make the product cost any more for you. Thanks for your help! Ordering online makes it so easy. Just browse a store, pick an item and it's delivered a few days later. Check! Something off your list!! 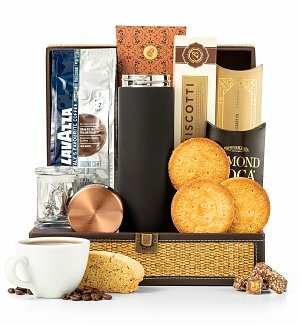 I order a lot of my gifts from GiftTree.com. I've chosen them to be an affiliate on my website because I love the wide choice of products, they have great customer service and I know I'll be proud to give whatever gift I choose for my recipient. 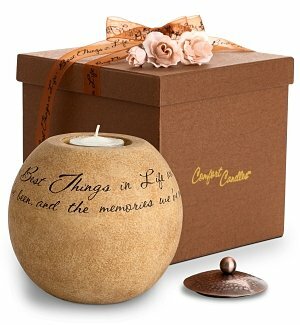 Here's an example of some things you can order from GiftTree.com. Cold, Hard Cash - Of course, cash is appreciated by anyone. You can give whatever amount you wish and the provider can choose how to use it. You could just come up with an amount you'd like to give, or give her an extra week's pay or give her a voluntary raise in each weeks fee. Personalized Gift Card - I love making personalized gift cards for people. It's unique. It's easy. And it puts a smile on everyone's face! At GiftCards.com you can personalize the card and make it any denomination you wish. 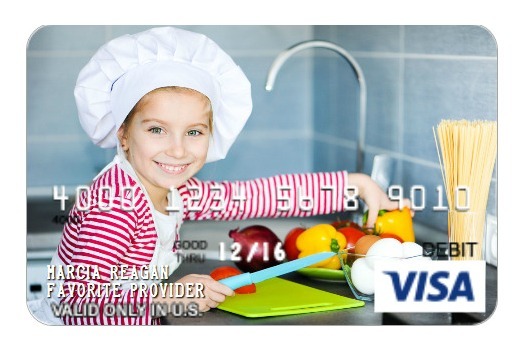 For a daycare provider, it would be adorable to put the children's picture on their gift card. Restaurant Gift Card - Always a great gift for daycare provider. Give a card to a restaurant that is a little fancier than they are used to. You can conveniently order a Restaurant Gift Card from Amazon. Coffee Shop Gift Card - After assuring that your provider is a coffee drinker, buy her a coffee shop gift card. If you are one of the early arrivals at daycare, you could offer to stop and pick up her coffee for a couple of mornings. Coffee Shop Gift Cards are also available from Amazon. Having a meal delivered from a local restaurant or a meal delivery service makes a nice gift for daycare provider. Your provider will appreciate not having to cook for her family for an evening or two. Gourmet Muffins or Bagels - Find a local shop that can create a nice gift basket with assorted muffins or bagels. Freezer Meals - Many towns have shops where you go in and prepare meals to put in freezer bags for future use. Prepare a couple for that gift for daycare provider and then deliver it to her to put in her freezer. She can pick the evening when she will not have to fix dinner for the family. If you do not live in a town with this type of shop, consider fixing a freezer meal yourself. 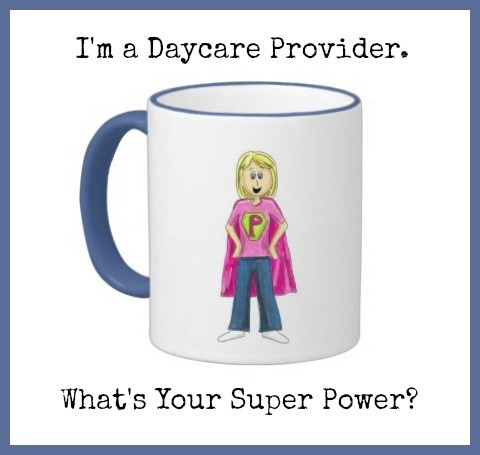 Every time I go to a conference to get my required annual training, the most popular booth in the vendor area is the booth that sells daycare t-shirts and sweatshirts. I know providers like wearing them! 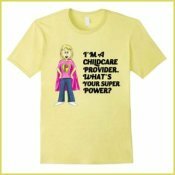 T-shirts and sweatshirts make an easy gift for daycare provider and they love having themed clothing to wear for work. Whether you get her a shirt from the store or custom design one, she's guaranteed to love it! 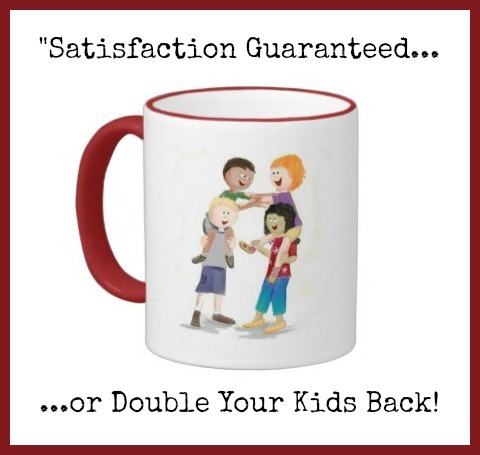 Click on any mug image for more information. 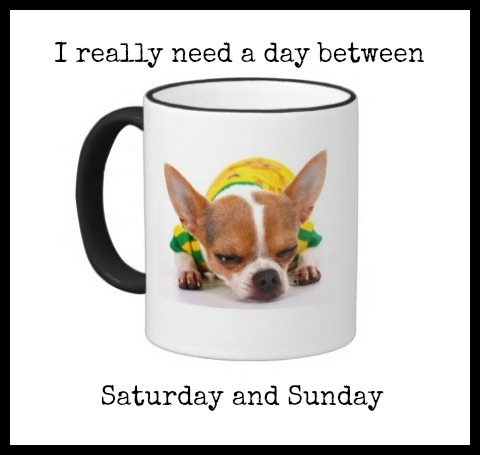 These coffee mugs are available at my Zazzle Store! Substitute Daycare Provider - A substitute provider has to meet requirements set by the licensing agency such as a complete background study and CPR training, but if you happen to meet these requirements, give your provider some time to herself. Maybe she could meet someone for lunch or go get her nails or hair done. Evening Babysitting - If your daycare provider has small children of her own, give her an evening of free babysitting while she enjoys a relaxing dinner, a movie or whatever else she may like. Housecleaning - Purchase professional cleaning service for a couple of times of free service. If that's out of your price range, offer to do the housecleaning service yourself for as many hours as you'd like your gift to value. Hey, it may not be the most glamorous thing to do, but it wouldn't cost you a thing! Day Spa Certificate - Your provider spends a lot of time taking care of children and taking care of her family. Give her a day where somebody takes care of her. She can choose from a massage, a facial, a manicure or a pedicure. Hair Salon Certificate - It can be for a service she's used to or it would allow her to splurge on something she's never had done before. Nail Salon Certificate - Daycare providers are typically not very good at doing special things for themselves. A nice set of acrylics or a french manicure is probably something they don't do for themselves very often. 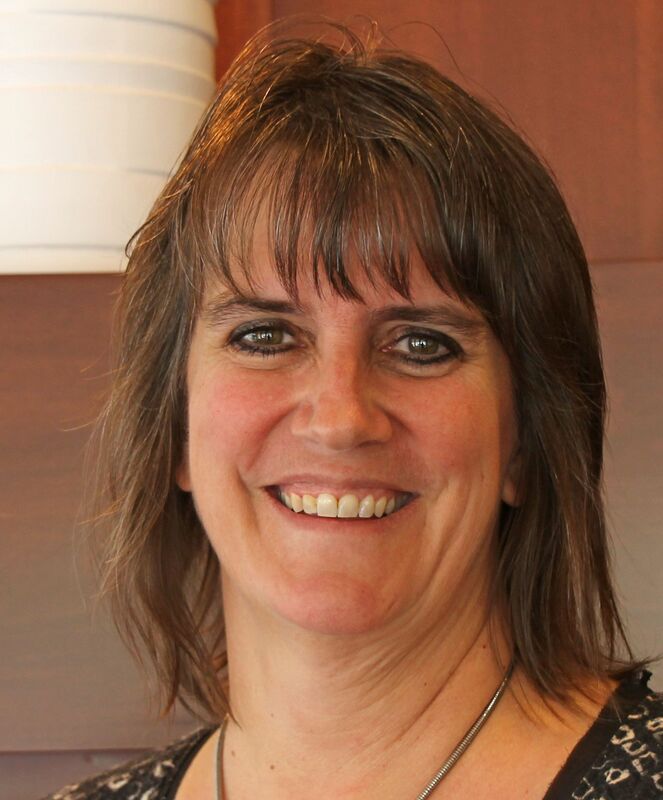 Foot Massager - A daycare provider's day is spent mostly on her feet. Nothing would feel better after a long day of chasing after children than to sit down on the couch and turn on a foot and calf massager. Concert/Play Tickets - Tickets to the local theater or to an upcoming concert coming to your town would give your provider a nice evening out. Movie Tickets - This gift can be used anytime and fits any personality. No matter what your provider's taste or preferences, there will be a movie at the theater for her to enjoy. The major chains of movie theaters sell gift cards on Amazon. Book Store Gift Card - Another very versatile gift. No matter your provider's taste, she'll be able to find a book to enjoy. I-Pod/I-Tunes Gift Card - If she doesn't have an I-Pod, introduce her to one. If she does have an I-Pod, supply her with more music. Net-Flix Membership - A monthly subscription service to have movies delivered right to her house. Add to a Collection - Find out if your provider has an special item she collects such as angels, dolphins, or unicorns. Then add to the collection. You could find an item in any price range you're aiming for. Professional Sports Clothing - Buy her a t-shirt, sweatshirt or any other item from her favorite sports team. Hobby Supplies - Scrapbooking and stamping are two very popular hobbies. For any hobby she may have, buy supplies she would not be willing to buy herself. I wouldn't suggest this gift idea for just any daycare provider, but if you're dealing with a provider who's just getting started in the business and has a lot of expenses trying to get her business running, she may very well appreciate these gifts. Art Supplies - Basic art supplies such as construction paper, scissors, glue, tempera paint or any other commonly used item. Toys - A new daycare can always use more toys and you could fit this into any price range you'd like to spend. Advertising Sign - Have a banner made for your provider to hang in her yard when she has openings in her daycare. Delivered Meal - Have a meal delivered to daycare so that the provider doesn't have to cook lunch one day. Digital Photo Frame - A gift that can be used for her family photos or for daycare photos. Willow Tree Figurines - Available at specialty stores and on Amazon, they feature angel figurines, along with parents, daycare providers, teachers and others with children. "Tenderness" "Child of My Heart"
Everyday Jewelry - Instead of something real sparkly, give her a piece of jewelry that would fit into her everyday wardrobe she wears for daycare. Mall Gift Card - A gift card to a local mall allows your daycare provider to shop at any store she chooses. Department Store Gift Card - Investigate into what her favorite department store is and buy her a gift card there. Warm Tootsies - Buy a pair of big, fuzzy socks. Fill them with tootsie rolls and attach a note that says, "Something to Keep Your Tootsie's Warm". It's a very inexpensive gift for daycare provider. It doesn't matter how much you choose to spend on a gift for daycare provider or what you decide to buy, just be sure to include a note or letter to let your daycare provider know how much you appreciate what she does for you and your child every single day. When deciding on the purchase of a gift for daycare provider, DON'T buy anything that refers to the provider as a babysitter. That's a guaranteed insult.